Frequency Specific Microcurrent or FSM is a gentle, painless but highly effective modality that uses very light electrical stimulation to reduce inflammation, speed healing, reduce scar tissue, and reduce pain in nearly any area of the body or any musculoskeletal condition. Its uses are numerous but include the following: post surgery cases, ankle sprains, fibromyalgia, chronic pain, fractures, neck pain, back pain, sciatica, shoulder pain, muscle strains and virtually any other injury. Microcurrent is current that is sub sensory or not detected by the body. FSM is different than other standard microcurrents because in FSM there are dual channels for specific frequencies that are specific for different tissues of the body. The FSM can be applied with damp pads or with the use of graphite gloves directly on the skin. 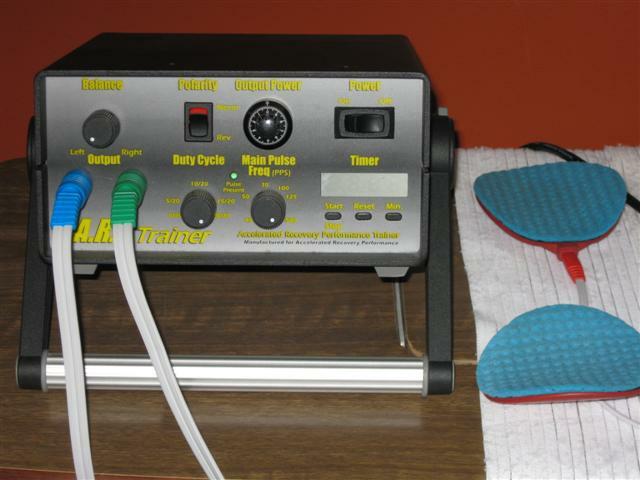 The ARP is a electrical simulation device that we use for rehabilitating many different types of injuries. The electrical stimulation device (the ARP) possesses specification characteristics that are not found in any conventional therapeutic neuromuscular electrical stimulator. ARP protocols can also be specifically used with the ARP to accelerate muscle rehabilitation of many post surgery cases, ankle sprains, ACL tears, and virtually an ligament injury. Before being treated with the ARP protocol the In-balance assessment is usually performed prior or near the beginning of initiating treatments. Although ARP treatments can be intense, results are worth the effort!